D for Diamonds - diamond set jewellery for children. A pair of sterling silver and gold plated double drop star earrings. All D for diamond jewellery comes with quality co-ordinated packaging. Each design incorporates a genuine diamond. A D for Diamonds watch with an adjustable purple strap. Featuring a clear easy to read dial this watch will help with learning to tell the time. This pretty watch features a genuine diamond and is beautifully presented in a D for Diamond gift box. Little women collection by D for Diamonds. 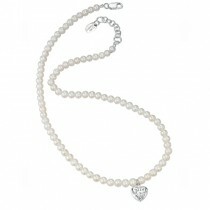 A very pretty pearl necklace with a diamond set heart with filigree detail. Each D for Diamonds piece incorporates genuine diamond(s). Supplied in a pretty D for Diamonds gift box.